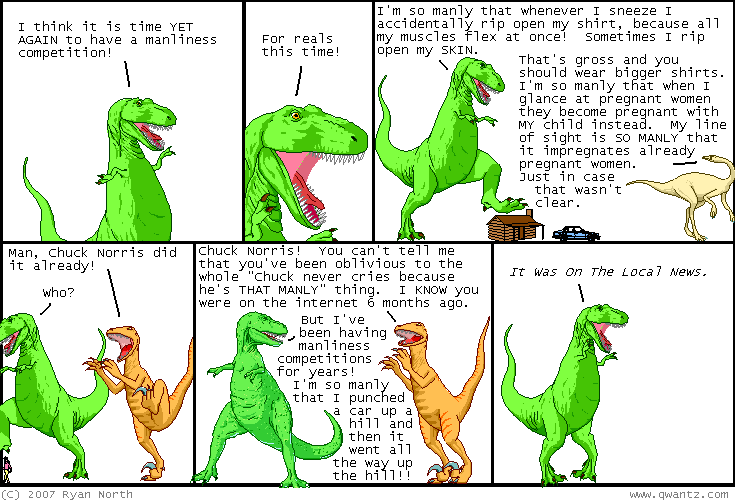 Dinosaur Comics - August 7th, 2007 - awesome fun times! August 7th, 2007: TCAF is coming up! That's the Toronto Comics Arts Festival, August 18th and 19th, and it is a great two-day celebration of comics right here in Toronto. There's a ton of great authors coming, AND it's free, AND I hope to see you there! It will seriously be fun times. This Thursday my brother Victor is having an art show at Resistor Gallery in Toronto, and if you're in the city you should come! It is called "COOL BUT CRUDE" and Ninja Turtle fans will both appreciate the reference and not be disappointed.